The Sleepyhead Grand Baby Pod, 9-36 months is a truly scrumptious versatile bit of baby kit that really is a one-of-a-kind product. Designed in Sweden, the award winning Sleepyhead Grand can be used for a number of reasons – whether you are looking for a safe way to co-sleep with bubba, somewhere soft and squidgy for them to chill out while you are busy getting on with some important email correspondence (otherwise known as sending the millionth close-up of your little angel at 5 months to the doting grandparents!) or even just somewhere practical to change their stinky bottom! Suitable when bambino is 9 months old, the Grand Baby Pod by Sleepyhead is the follow-on from the Sleepyhead Deluxe Plus Baby Pod and is perfectly usable until your little dot is around 36 months. The Sleepyhead Grand Baby Pod, 9-36 months provides a safe and comfortable environment for children to snuggle up and aids the often difficult transition from a crib to a bed thanks to built-in air permeable textile bumpers that act as bed rails stopping little people from rolling onto the floor! Once they are ready, simply remove the Sleepyhead Grand Baby Pod and your little one will drift peacefully off to sleep in their big bed. Being lightweight and portable, the Sleepyhead Grand Baby Pod is ideal for travel, either from room to room, to grandma's house or even on holiday (or somewhere more extravagant!). Why should I buy the Sleepyhead Grand Baby Pod, 9-36 months? 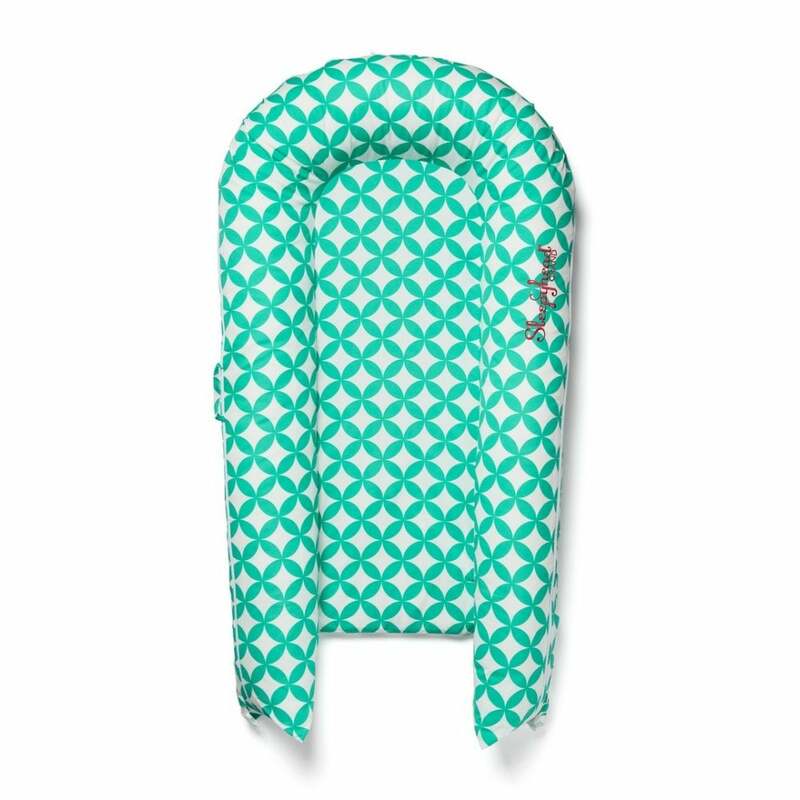 The hypoallergenic and breathable cover that comes with your Sleepyhead Grand Baby Pod is removable so can be zipped off and popped into the washing machine with ease. There are spares covers available. The zippers around the outside of the pod’s cover have child-safe pull-tabs. Additional covers are available to purchase separately to match your mood, room and style. These are also a great idea to have to hand during wash days! Yes, the Sleepyhead Grand Baby Pod covers are fully machine washable (please see care instructions!). The Sleepyhead Grand Baby Pod, 9-36 months measures 600mm wide, 1020mm in length and 220mm in depth. That’s a considerable plush cushioned surface for any little angel! More facts for you folks: the actual sleeping area within the bumpers measures 310mm wide and 820mm long, and the pod weighs 3.5kg. The fabric has anti-microbial properties and has been certified by Oeko-Tex as being produced in environmentally friendly methods and has met the strict human ecological requirements necessary in textile production. Are there any accessories I should get with my Sleepyhead Grand Baby Pod, 9-36 months? Absolutely; the Sleepyhead Grand Transport Bag is essential and so are a couple of Sleepyhead Grand Replacement Covers. What are the care instructions for the Sleepyhead Grand Baby Pod, 9-36 months? Cover only must not be tumble dried. Bumper only must be tumble dried. *IMPORTANT: Please always follow all care and use instructions the pod comes with. Where can I read a review for the Sleepyhead Grand Baby Pod, 9-36 months? Showing our 8 Sleepyhead Grand Baby Pod, 9-36 months reviews with an average rating of Excellent. Would you like to write a review? Your Review - Fantastic service, my order arrived within two days of ordering. Your Review - Fantastic service from this company! Delivered super quick, even over a Bank Holiday. Love this product, exactly as expected. Your Review - Great product. I had bought the sleepyhead deluxe before this and my baby girl has always slept very well. I swear it's because of these pods. The price is quite expensive for what it actually is but it's worth every penny in good sleep! This isfrien our second pod.First was a deluxe for new baby and it's so handy that we continue with this larger size. Have recommended it to all friends. We use this for everything, and it's come in so handy when we least expected it to. Great value for money and we'd recommend to all parents of a young child. A friend had told about the sleepyhead pod's, and I only wish that I'd purchased one sooner. We use it for everything and take it everywhere, and we especially like how it can be used as a travel cot. We're yet to find all of it's uses!